California is known for alternative energy enthusiasm and dedication to energy usage reductions. As part of that, back in 2007, the state launched a $3.3 billion effort to install 3,000 MW of new solar capacity over the next decade. California is one of the US states in which the use of solar energy is encouraged most, and this encouragement (because of the California Solar Initiative) has been so successful that a record-breaking 391 MW of solar panels were installed in California in 2012, 26% more than 2011. 391 MW translates into 117 MW for solar when cloudy weather and night are factored in (capacity factor: 30%). This can power approximately 39,000 homes. Through the end of the first quarter of 2013, 1,692 MW were installed at roughly 168,000 sites. 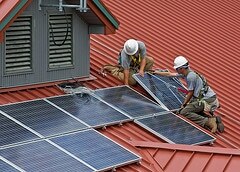 The California Solar Initiative’s road map calls for 1,750 MW of new solar power plants to be installed on residential and commercial rooftops in that state by 2016. The greatest news, however, is this: Since 2007, the cost to install solar systems decreased from $8.77 per watt to 5.98 per watt. That is $17,940 for a 3 kW system, which would have cost $26,310 in 2007. That is a whopping $8,370 difference! The cost of an almost-new car! Now to burst your bubble: The California Solar Initiative rebates provided are not for off-grid solar systems. I believe that they should cover those systems as well, if not even more than grid-tied systems because off-grid systems have the issues of energy storage and variability taken care of already. For every house that goes off the grid, that is one less solar system to back up, reducing the need for grid-energy storage and natural gas backup.